Here at WhyNotFathers, we are all about the mantra of father’s being involved in life. So why would we make a big deal out of Lupus Awareness Month? Easy… Our founder, Carl, has Lupus. 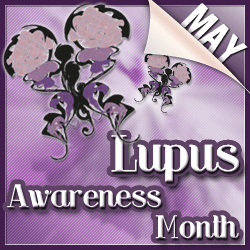 I was diagnosed with Lupus in August of 1999. It was a difficult summer, my wife and I had just purchased a new home for our family. We had a newborn in the house, not to mention our other three children. I started losing weight in Davidh of that year. It started slowly. In late May it began in earnest. I ended up losing nearly 100 pounds in 90 days. At first the doctor’s didn’t know what to make of my illness. I was diagnosed with pneumonia many times and spent a lot of time in the hospital. I was tested for everything from Legionnaire’s Disease to Parkinson’s. I was told at one point that the doctor’s were 95% sure I had cancer. Even the tests for Lupus didn’t indicate that I had the disease. Finally, in mid-August, the doctor’s in our hometown decided that they had done all that they could do, and in order to save my life they had to send me elsewhere. The decision to send me to Mayo Clinic in Rochester, MN was made. I was just coming out of sedation for a procedure to determine why I was bleeding internally when the doctors told me. “We are going to send you to the Mayo Clinic. We have done everything we can here,” they said. “What about my family?” I asked. “In a few minutes, your wife will bring your kids in so that you can say good-bye.” was their response. So my wife brought the kids in to say good bye to daddy. Very hard and emotional moment. I was strapped to a board and an ambulance took me to the airport where I was placed in a puddle jumper. I had a limited view out the window. I could see a sliver of sky and it was an incredible shade of blue. I couldn’t move at all because of how they had me strapped in. It is not a mean’s of travel that I recommend. I spent five luxurious days at the Mayo Clinic where they ran every test again. 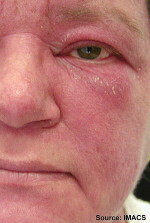 In the end the diagnosis was Systemic Lupus Erythematosus (SLE or Lupus). I had major organ involvement. It attacked my heart, lungs, liver, kidneys and central nervous system. They said that even a delay of a couple of days in diagnosis, and they might not have been able to save me. One of the better things to come out of the diagnosis… I quit smoking. It is said that it takes 3 weeks to learn a new habit. Since I was in the hospital for 3 weeks, and couldn’t smoke, I decided to not take up the habit again. I jokingly tell people that I quit smoking because the doctor’s wouldn’t let me take my oxygen tank downstairs with me. More tomorrow about Lupus, what it is and what it isn’t.